Angela Merkel has said she will not seek re-election as Germany's chancellor as well as CDU's party chair. The decision comes after a debacle for her ruling party in the local elections in the federal state of Hesse. On Sunday, Merkel's Christian Democratic Union (CDU) received 28 percent of the votes. Although that was more support than other competitors received, it was a significant drop from the 38.3 percent won by the party in the state's last election in 2013. However, Merkel claimed that her decision not to run for party chair again was made before the plebiscite and even before German parliament’s summer recess. Party chair aside, the top politician also would not be available for another term as a chancellor. This fourth term is my last as German chancellor. At the federal election in 2021, I will not stand again as chancellor candidate, nor as a candidate for the Bundestag, and...I won't seek any further political offices. What's more, if snap elections need to take place before 2021, Merkel would not run for the top post either. She also stated that the government has "lost credibility." A decision not to head for re-election as chief of the CDU and to not ditch the chancellorship “looks like a plan” that has been carefully devised, German lawyer Maximilian Krah told RT. However, if a Merkel critic takes center stage as party leader, there will be a different outcome. But even if that were the case, the CDU is unlikely to publicly turn on its current leader, as it is “very submissive” towards the chancellor. As the CDU experiences losses in support, the right-wing Alternative for Germany (AfD) party is seeing a rise in popularity. It received 12 percent of the votes in Hesse on Sunday, and now holds parliamentary seats in every single German state. 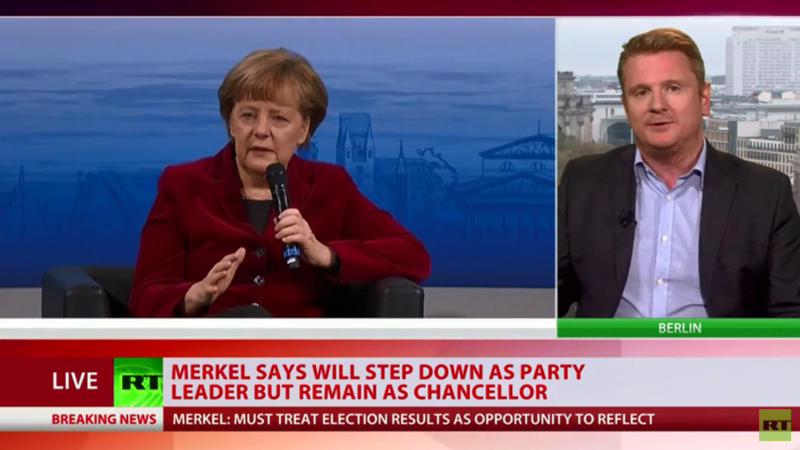 Speaking to RT following the Hesse elections, independent political observer Steven Meissner said that Merkel “is getting weaker and weaker and more unpopular.” That brings her team more problems than benefits, he alleged. Merkel's popularity has indeed been slipping for a long time, with her handling of the 2015 migrant crisis being a major contributing factor. A July poll found that only one in five Germans were happy with her performance as leader. Dr. Werner Patzelt, a political science professor at the Technical University of Dresden, thinks that the chancellor's handling of migration issue is mostly to blame for her party’s reduced support. “The core problem of the CDU is the migration politics conducted by Chancellor Merkel. For many years now, German voters have revolted against these politics and they voted for the AfD and defected from the CDU…” In fact, AfD has filled a representation gap that was left when the CDU began shifting towards the center-left. Merkel, 64, chaired the CDU party since 2000 and has served as Germany's chancellor since 2005.